It’s never too early to start planning for spring projects! Most of the homeowners that we work with are using this pre-spring season to begin their planning and acquisition of mulches, gravels, patio pavers and all the other pieces of a spring refresh! Hard work can seem like a big job come spring, but doing it yourself is a great way to save money and get some exercise. From what the customers that do it themselves tell us, they like being in full control over the look and feel of their landscape. It also gives them the chance to use some creative expression as they build new features for their yard. Since it can easily cost thousands of dollars for even simple landscape projects, doing it yourself is an easy way to save a lot of money. Don’t waste time and energy with the hassle of going to the hardware store or garden store and having to load bags of messy, heavy mulch and gravel into the back of your car – get it delivered instead. There are several providers of landscaping products that offer direct, affordable delivery throughout the KC metro area. Consider that many people are injured every year (especially back injuries) during the spring season from trying to lift too much, so save yourself the trouble! Installing fixtures like a fire pit or fire place are perfect spring patio projects. You get to enjoy them all year, they look great and they’re relatively easy to install yourself. There are a lot of options for these too, from open fire rings to self contained stone/brick encircled fire pits. Plus, if you’re already getting mulches and gravels delivered, most carriers will deliver a fire pit too if you ask. We also like fire pits because they are a great complement to the decks we build – adding an even greater opportunity for usage of the back yard for most homeowners! If you’re looking for a place to get the best prices and a wide selection for your outdoor home improvement projects, check out the new River Bend Rock & Mulch. Azek decking is the stuff that keeps your new deck from needing maintenance year after year. More and more of our customers are asking us about building beautiful decks that will both stand as testaments to quality craftsmanship and style, and maintain those qualities without having to invest huge amounts of time and money into them a year or two down the road. To these customers, we recommend using composite materials, and Azek is one of our favorite brands. One big reason that we use Azek is its built-in style. From the finished project, to individual planks, every piece of material is beautiful. While there is a rustic natural beauty to wood materials, Azek features vibrant, long-lasting color and textures that look natural and even feel nice on bare feet. The materials are more than just high-quality, they have a unique style to them that is inviting to homeowners and their guests alike. We are also very fond of the sustainability aspect of using composite materials. First, there is no need to tear down another tree to build a deck, instead the Azek materials are made of recyclable plastic composites. Plus, the useful life of the composite materials is as long or better than wood materials, and requires only a fraction of the time, labor and chemicals required to maintain a wood counterpart. Cleaning and maintenance is largely a function of soap and water, not special chemicals that can be leached into the ground. These decks hold their value too. They last a long time and require little maintenance, and you can believe that a future home buyer will find that just as appealing as you do. Plus, with a few modifications, you can use these decks to create more living spaces when you add things like underdeck ceilings – they hold up to the elements and help create long-lasting outdoor spaces. If you like the idea of composite but aren’t ready to commit – why not use wood and composite materials together in the same space? Many of our customers either use wood accents, or build the primary support pylons using wood, but build the deck floor with composite material. This is a smart way to get the easy maintenance (and fewer splinters in your feet!) of composite with the beauty of natural wood, and we highly recommend it. Underdeck Ceiling Uses – Pets! There’s another prime use for the space under your deck, a home for your pets! Especially for dogs, the underside of a deck can serve as a shelter that gives pets access to the outdoors with the comforts offered with indoor living. There are a couple ways to accomplish the construction of a home for your pets. First, we recommend outfitting any raised deck with an unreduced ceiling. This ceiling provides an alternative to the basic spaces in your deck’s woodwork, filling the spaces instead with secured metal just underneath. The metal ceiling is similar to the siding you may have on your home except that it is laid horizontally. The metal pieces connect together to provide a waterproof sheet for the underside of your deck. Water drains to the edges and out through a downspout, keeping the water away from the deck and its underside. What this means is that you can create a comfy home for your pet outdoors as weak as in. This is a great option for the owner who has to spend a lot of time away from home and the pet. By adding an outdoor space specifically for the pet, it enables owners to leave the pet outdoors for longer periods of time. And, if you’re feeling particularly adventurous, adding a dog house isn’t an unreasonable move. A small dog house can help your pet stay safe in a more dangerous weather situation like a snowstorm. Of course an underdeck ceiling has many uses, and will generally improve the look of a home as well as its value. Pet care is just one potential benefit of having them installed, but you also have the opportunity to use the space for a lot more. We’ve seen homeowners use these spaces as outdoor sitting rooms, additional storage spaces and even temperature controlled home additions. Home improvements are the little things that keep your home from looking like it was purchased out of a 1980s Sears catalogue. Of course, home improvements can also serve the practical purpose of maintaining good home health. We believe that home improvements should address the aspects of both form and function, and that a little proactive home improvement can eliminate the needed for a complete home renovation later on. Step One in our guide to constant improvement: keep it constant. Like car maintenance, being proactive can save lots of money and headaches down the road. It’s especially important for your home to be kept as up to date as possible, and the reason goes far beyond maintenance needs. Keeping your home stylistically up to date with new decorations, paint schemes and furniture will not only help your home be more enjoyable, but could possibly save you thousands of dollars down the road when you’re ready to sell it. By updating it piece by piece, over the course of years, you will have a home that others will envy – all from just a little work. Step Two: don’t be afraid to make a change. Some people hold themselves back from making changes because they aren’t sure what the results will be – but that philosophy will never lead to growth or improvement! When it comes to your home, if you aren’t sure about making changes then talk to a professional. For example, when we build decks for homeowners, most aren’t quite sure what kind of deck they’d ultimately like. We custom design and plan each deck individually, and since we do this for a living, we’re pretty good at it! You don’t have to be the expert on everything, you just can’t be afraid to make the home upgrades that will keep it looking modern and fresh. Step Three: budget for it. Having the money set aside and earmarked for home improvement is a great idea. If you’re ready to start improving your home piece by piece, then start by setting a little money aside each month with the specific intention of spending it on home improvements. Over time, it will grow and you will be able to take on minor projects or have a big head start on a major one. You don’t even have to set all that much aside, and it will be well worth it for the added joy you get out of home ownership! Spending time outside on your deck can be a great source of relaxation and a fun place to entertain and enjoy family time. But like your indoor living space, your outdoor living space needs maintenance and upkeep to keep it in tip-top shape and preserve it for the future. Refinishing your wood deck is a great way to protect and extend the life of your deck and boost its visual appeal when spend time there. Give your deck a good cleaning to remove any debris with a broom or power blower. You will need to begin by inspecting your deck to locate any split or rotting boards. These will need to be replaced before you begin refinishing. If you deck has a transparent or semi-transparent coating, you can merely clean it with a good wood deck cleaner. This should remove mildew stains and the ultra-violet bleaching of the wood, as well as clean the wood of dirt and deposits. If you need more cleaning, perform a safe power washing. You can see detailed instructions for this on our previous blog. Power washing may cause splinters because the wood fibers expand with washing and remain raised. Sanding will knock down these splinters and create an optimal surface for staining. There are many different tools and grits of sandpapers to choose from, so you’ll want to look into your options and desired results before you get started. The deck must be dry for two days before you apply any stain because absorbed water in the wood will prevent the absorption of oil stain. Stains and sealants offer many options with separate products or combinations. Transparent stains allow you to see the grain of the wood to show through, while an opaque stain will provide coverage like paint. You can test the color you’d like on an unseen part of your deck because the color of stain when dried may be different than the brochure. Used stain or sealer that is water repellent, and avoid clear finishes such as polyurethane or varnish because the can degrade under the sun’s rays. There are many different tools to choose from for applying stain and sealant on the main portion of your deck, and for applying to small areas and trim boards. Now it’s time to responsibly clean up oily/flammable rags, and ENJOY your deck! Once it’s past labor day, most of us just try to enjoy the last days of summer and get our homes ready for the inevitable winter to come. Just like many practice a spring cleaning, so too do they practice the ritual of prepping their homes for fall and beyond. Checking the furnace, clearing out the hoses and sealing windows are all important tasks, but not nearly as much fun as power washing the deck! If you’re like us, power washing isn’t a chore, it’s the chance to do cleaning with power tools. And everyone knows adding power tools to any task makes it far more enjoyable. But it’s important to remember that a power washer is, in fact, a real power tool that can cause a lot of actual damage. Homeowners with decks need to understand the importance of power washing, and at the same time, understand that there is a proper, safe technique that must be used. First off, and this should be obvious to everyone, a power washer is a power tool and not a toy. Make sure not to put any body parts in front of the high-pressure water coming out the end. Do you really want to find out what happens to a finger or hand placed in front of a water cannon that can strip layers off of wood? The point of a power wash is to remove dirt, moss, fungus and other debris from a deck. For this process, set your pressure washed to as low power as possible while still being effective. With cedar and pine, you probably won’t want to exceed about 600 psi, and even with harder woods you probably won’t need to go over 1500 psi. Start washing about 2 feet away by pulling the trigger while using a fan tip, and move closer until the distance is about one foot to 18 inches. Most of the time, you shouldn’t need to get closer than about a foot away, and in such cases you should have the power washer on a low setting. “Sweep” the deck in a fanning motion with the water while doing your best to maintain a consistent distance from the deck. Work away from the house and with the grain of the deck until the entire thing is clean. After you’re done cleaning, grab the sander and get rid of those splintered areas. If you’ve done a great job cleaning, a few touch ups may be all it takes. If you’re planning to restain the deck, then sand the whole thing – trust us, it will make your life a lot easier later on! Fire pits are an easy and fun way to make any backyard a gathering place for your friends and neighbors. Depending on the city where you live, you may be able to have a fire pit right on your back patio or further in your back yard. We highly recommend fire pits because they look great, create a space for people to gather and are surprisingly easy to install yourself or with the help of your family. Before you get started, make sure to check the regulations for your city regarding fire pits – some Kansas City area municipalities count a fire pit as an open fire, so unlike a barbecue grill, they must be placed at least a certain distance away from your home (however, covering the pit with screen can change it’s status to an enclosed fire). First, pick out the spot where you’d like to install the fire pit. Make sure it meets with the regulations, and find a spot that is already level in the yard. If you can’t find a level spot that you like, you can level it out yourself using special types of sand. Next, pick out your fire pit and have it delivered. You can always bring it home yourself, but fire pits are heavy so be careful. Your pit will likely come to your home as a palette of rounded concrete slabs. Assemble your fire pit in a ring using any recommended adhesives. Fill the base with sand or gravel (fire resistant gravel) and get some firewood to start enjoying your fire pit! The whole process should take a half hour to an hour, with the most difficult part being getting the ground prepared if it isn’t already. Don’t miss out, complement your new deck with the right fire pit and start enjoying the outdoors all year round! This is the spring of the remodel here in the Kansas City area. It’s starting to feel like summer outside, and projects around Kansas City are moving toward completion. According to the Kansas City Planning Committee, more than 70 percent of homes in Kansas City were built before 1990 – and that was 26 years ago! Out in the suburbs, the homes tend to be a bit more recent, but many were constructed in the late 80s and early 90s. When a home gets to be about 20 years old, it starts to experience certain cosmetic and structural issues. In particular, the breakdown exterior protections, like the kind that paints offer, means that homes are more likely to experience problems like wood rot. In addition, the rated life of most shingle roofs are somewhere between 20 and 30 years old. A exterior remodel can be a good option for dealing all of these issues simultaneous. It’s not just structural damage that makes people want to undertake a remodel. After 20 or 30 years, sometimes a new look is the best thing you can give your home and yourself. A remodel can encompass the installation of siding, new roofing materials, new colors, new home additions like garages or sunrooms, and even decks and patios. Some of the most interesting homes in the more recent developments around the metro stand out thanks to remodels as opposed to original construction. The most important factor to consider when getting a remodel is the organization you hire to help you make it happen. The remodeler should have a positive reputation and experience completing the tasks you need accomplished. Good remodelers know their own limitations and will recommend or bring in contractors to complete specialized portions of a remodel (like electrical wiring). They should also be able to help you find a design that you like for your home and bring your vision to life on paper before ever starting the actual build. 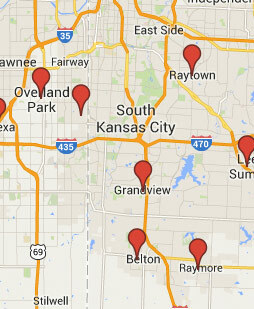 To learn more about remodeling in Overland Park and the Kansas City area in general, please contact us. 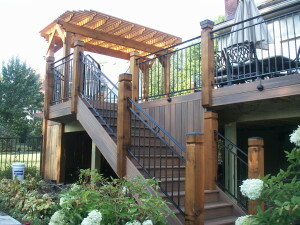 It’s not too late to get started on your outdoor deck, patio or home renovation this spring! Kansas City is getting warm quickly, and soon it will be full-time outdoor weather. Don’s miss out on your chance to get a brand new deck added onto your home or business. Opportunities to schedule deck building estimates are filing up fast with the warm weather rapidly approaching. We will work with your schedule to get your new or replacement deck designed and installed as soon as possible, but to make sure you’re able to get an appointment for this year, it’s important to contact us as soon as possible. Because we believe in doing a great job for every client no matter the project, we can only accept limited requests for exterior or interior renovations – this helps us make sure that we have time to complete each project to each client’s 100% satisfaction. If you’re looking for ideas to start your spring project, why not check out our photo galleries. These galleries show off most of our work and will give you an idea of the kind of quality, in both design and build, that you can expect when you work with Alexander Decks and Alexander Homes. Each deck that we build is custom designed to match the home, whether it’s low deck for a bungalow in Prairie Village or an entire outdoor living room with a full kitchen, multiple landings and a hot tub in south Olathe, we build it just right. Homeowners enjoy the seamless experience of working with one team of professionals that make getting their next easy and even fun. Call the team with the vision who will make your next deck building experience a breeze. Contact Alexander Decks today to get an estimate and start planning your new outdoor living space! It’s warming up outside, and our money is on deck season being here to stay! Homeowners in Overland Park are starting to head outside for the comfort of warmer weather in the outdoors, and there’s no better time to get your deck installed, or have an old deck removed and replaced. 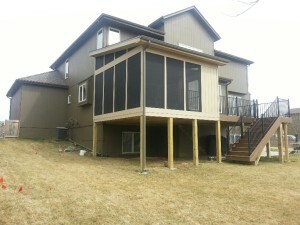 Last year, we worked on a deck in Kansas City that was rotted so badly the homeowners were afraid to step foot on it. Our photographer told us that while he stood on steps of this deck, the entire thing actually swayed away from the wall it was connect to. Needless to say, he decided that taking pictures from ground level was probably a safer idea. These homeowners decided that it was finally time to get the dangerous eyesore rebuilt, and what we designed and built for them was not only gorgeous, but left our photographer feeling much safer than when he first visited the house! We think the pictures speak for themselves here. We build the highest quality decks and home additions in the Kansas City area, and our customers love working with us because every project is constructed to fit a plan developed specifically for each home. No cookie cutter designs, only genuine, artisan craftsmanship. We’ve got even more projects in the works for this spring, we’ll be sharing more pictures and stories right here at our blog and in our portfolio. Check back often for more inspiring images and homes from across Kansas City.